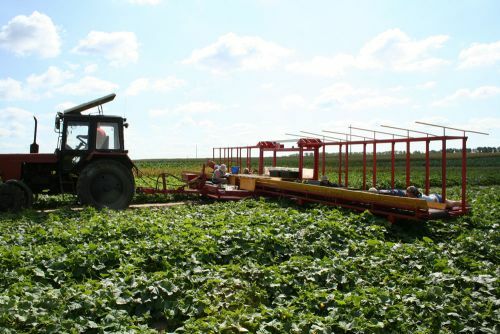 Belorussian scientists created combine for harvesting cucumbers. 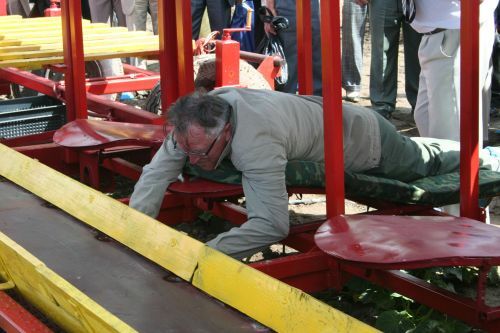 In the institute of the vegetable-growing of republic Belarus was invented a harvesting platform for the cucumbers, for optimizing labor. Properties are more than urgent under the conditions harvestings. In more detail about highly technological novelty tells Alexander, doctor of agricultural sciences, the director of the institute of the vegetable-growing. The specific character of the cultivation of cucumbers is such, that leaves of different plants tightly are interwoven between themselves, and the united mass of plants is formed, says Alexander Alexandrovich. – When fruits are removed by hand, plants seriously will be traumatized. In the vegetable-garden it is possible to gather harvest accurately, but on the large cucumber plantation? So it is important to us to create a solution, which optimizes labor and is not harming plants. The principle of the operation of harvesting platform is a machine which is located above the plant and moves. 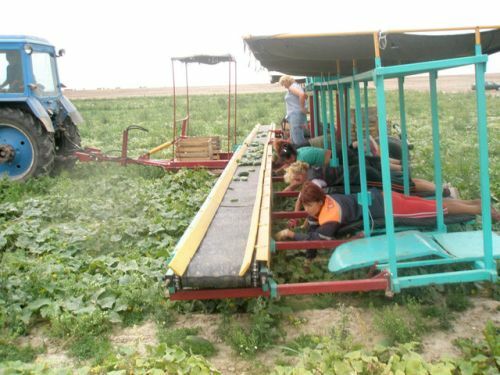 Cleaners (their 10 people plus the operator of tractor) in the process of the collection of cucumbers separate leaves, they find fruits, tear away them and throw them on the conveyer which is about 15 meters long, and it moves them to the center. What is the basic complexity with the development of this machine?- men must be located, at proper height, the speed of the motion of the machine and the speed of the motion of conveyer are such difficult things. By calculations they established that the optimum height of profile – is 30-40 centimeters, and the speed of the tractor – about 1 kilometers an hour: indeed it is necessary to have time to move apart leaves, to detach cucumber, to place it to the conveyer, moreover the convenience was also considered, so that to the working men can lie on the platform. Also for the convenience we arranged soft cushions on the platform. Is important the fact that on the platform it is possible to establish receiver – nevertheless it is merrier with the music. The platform was created according to the joint Belorussian- Russian program with the financial support of union state. It was prepared by specialists; the development of novelty were occupied 4 design engineers. Now 2 platforms are located in Belarus. 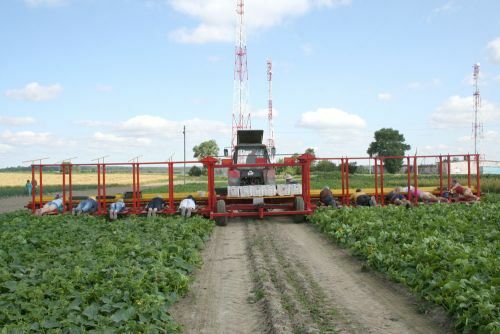 In our country it is planned to create raw zones on the production of the cucumbers. – The harvest of cucumbers did increase? – Productivity grew, moreover several times. But the main thing is that in the fact we preserve plants. The period of fruiting grows. 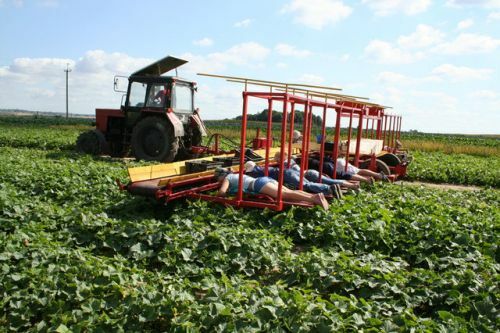 Moreover, our platform is suitable also for harvesting summer squashes. Musíš byť prihlásený, ak chceš pridať reakciu.